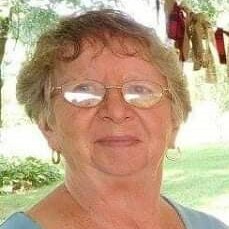 Carolyne Helen Saffell, 76, of Kingsbury, Indiana and Zephyrhills Florida, joined her Jesus in Heaven on Friday, November 23, 2018. Carolyne was born September 20, 1942 in Cleveland, Tennessee to Mr. and Mrs. Arlen Geren. On June 19, 1959 Carolyne married Franklin (Glen) Saffell who survives. Carolyne is survived by her husband, Glen; a daughter, Tonda (Rod) Cranor of Fort Wayne, Indiana; a son, Steven (Danea) Saffell of Schaumburg, Illinois; six grandchildren, Jordan (Deanna) Cranor, Cameron (Haley) Cranor, Hannah Cranor, Caleb (Celeste) Saffell, Kearstin Saffell, and Brandon Saffell; three great-grandchildren, Titus Cranor, Calvin Saffell and Levi Cranor; a sister, Arlene (Jim) Caywood of Cleveland, Tennessee; and four brothers, Harold (Joanne) Geren of Crystal Lake, Illinois, Frank (Barb) Geren of Clearwater, Florida, Patton Geren of Tennessee, and Ronald Geren of La Porte, Indiana. She was preceded in death by her twin daughters, Linda and Glenda Saffell. Carolyne was happiest when serving others. At church she served in many capacities, from VBS director and teacher, Ladies Missionary Fellowship, the board of Child Evangelism Fellowship, various hospitality committees, to coordinating the annual Kingsbury Church Egg Hunt. Carolyne was a foster parent to more than 65 teens through the Fairview Youth Treatment Center. She was a co-owner of The Flower Factory of LaPorte and the Mount Zion Grocery of Cleveland Tennessee. She even drove a school bus for the LaPorte Community Schools and was the local coordinator for Real Services senior meal program. Visitation will be from 1-2 p.m. on Saturday, December 1, 2018 at Calvary Baptist Church, 1808 “I” Street, La Porte, Indiana. A funeral service will be immediately following at 2 p.m. in the church. Pastor Tim Schryer will officiate. Frank L. Keszei Funeral Home, Essling Chapel, 1117 Indiana Avenue, La Porte, Indiana is in charge of arrangements. Memorial contributions may be made to Calvary Baptist Church, 1808 “I” Street, La Porte, Indiana 46350 or American Cancer Society, 5635 W. 96th Street Suite 100, Indianapolis, Indiana 46278.